In this weekly column, I typically explore some young players who haven’t made much of a consistent impact to date on their fantasy football teams. Some players may be available on your waiver wire, some may be available via a cheap or moderate trade. Acquiring or not acquiring one of these players could decide how well your dynasty or keeper team does for the next few years. This week I take a look at two exciting Colts: TY Hilton and Dwayne Allen. WR TY Hilton, IND- Sometimes I just know when to pick them, it is hard to get better than a nine catch, 223 yard receiving, and one touchdown night in prime time. If this game tells us the fantasy football world anything, it is that Reggie Wayne might be fading some, and that Andrew Luck’s trust along with chemistry in Hilton are growing exponentially. From his first catch of the night, you clearly see that Hilton tracks the ball well in the air, possesses good concentration to focus on the trajectory of the pigskin, and that physical coverage will not impede him from making a difficult reception. The wide out adjusts his body to make difficult catches, while taking the angles that make him more difficult for defensive backs to bring him down. If defenses learn anything from this game, it is that you cannot give him a free release off the line of scrimmage. Hilton raced down the gridiron, fully extended to make a fingertip catch 50 yards downfield while getting his feet tangled with a defender on the five yard line or he would have scored on that play. Hilton’s timing with Luck is improving as the young wide out makes the catch in stride and does a better job protecting himself from the big hits headed his way. I was a bit surprised to see him featured in a few one receiver sets ahead of Wayne. These had always been in the past reserved for the future Hall of Famer. This further demonstrates the coaching staff’s trust in the young play maker. Hilton’s catch radius is improving, even digging up a worm burner for a first down. His route running shows more crispness, creating more degrees of separation between him and the defensive backs covering him. The wide out continues to improve his ability to shield the ball and is demonstrating a knack for adapting to a more physical game despite his 5′ 9″ 178 lbs. size. I’m a little confused with what the Colts coaching staff planned on his failed two point conversion play, perhaps he planned to throw the ball to Luck? I doubt you will be able to a trade for Hilton for anything reasonable after this game, but perhaps if you own him, you might choose to sell him highly. The young receiver has not proven to be a consistent fantasy or NFL weekly performer and his quarterback does not seem to play favorites. I plan on holding him in the only league I own him, but do not be afraid to listen to offers. If you can capitalize on this game, test the waters. It might be worth it, but it is hard to imagine that he will amount to more than a low-end WR2 or high WR3 depending on the size of your league. TE Dwayne Allen, IND- The third year tight end has been one of the most consistent targets for Luck this season and seemed to be underrated by most fantasy owners coming off an injury shortened second year. What I love about Allen is that he is a complete tight end, which simply means he is as dangerous blocking as he is catching the football. It’s his versatility that separates him from most of his peers save for Gronkowski. Allen will line up beside the offensive tackle, as a fullback, split out wide, sent in motion, and in the slot. The tight end can seal off a lane in the running game, creating an alley to run through (we all know Trent Richardson craves those). He also excels at sneaking down the field on a pass route, finding a soft spot in the zone. This tight end will climb the ladder to catch the ball at its highest point, runs crisp routes, and has huge, soft hands that make catching the pigskin look easy. When defenses choose to cover him with linebackers, Allen makes contested receptions with defenders draped all over him. Safeties would be a better matchup against him coverage-wise, but this tight end would simply swat them away. He is a great red zone threat despite not catching any against the Texans, but does have four touchdowns so far this season. It’s still surprising how many fantasy owners prefer his teammate Coby Fleener over him. Always give me the guy who is always on the field. 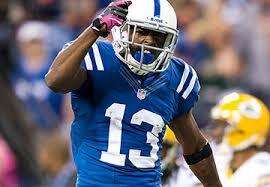 His role continues to grow with the aging of Wayne and the inconsistency of the Colts rushing game. Perhaps now is the time to take advantage of his down game of three catches for 49 yards to grab him in a trade to secure your tight end position for the net five to seven years.